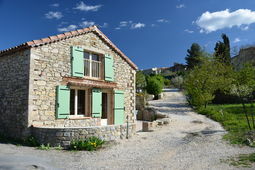 Self-catering Gîte with 4 bedrooms and 5 bathrooms. Sleeps 8. Saturday changeover. 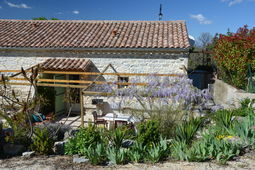 Self-catering Gîte with 5 bedrooms and 3 bathrooms. Sleeps 12. Non-applicable changeover. Bordered by the Pyrenees, Andora and Spain in the south, Languedoc Roussillon is noted for its relaxed pace of life. It extends north as far as the Massive Central and has a long Mediterranean coastline of sandy beaches stretching 180km from the Spanish border to the Camargue. Languedoc encompasses the largest wine producing area of Europe. 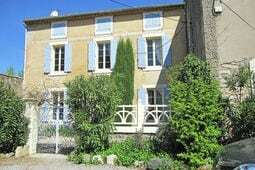 Situated in the extreme south of France, the region extends along the Mediterranean coast from the north eastern ranges of the Pyrenees and the Spanish border, to Provence, then inland to the Midi-Pyrenees and as far north as the Auvergne. 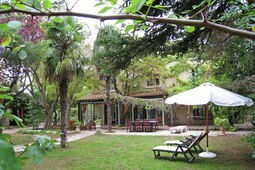 Montpellier, the regional capital, is a fine university city with many 17th and 18th century houses, wide boulevards, parks and gardens. The Jardin des Plantes was the first botanical garden in France, built in 1593. Sète is the largest Mediterranean fishing port on the coast of France and has many excellent fish restaurants. The writer Paul Valéry is buried there and there is a room devoted to him in the Municipal Museum. In July and August there are water jousting festivals. Narbonne, founded by the Romans, is a busy centre for the wine trade with good shopping. The Cathedral of St-Just rivals those of northern France and has some beautiful tapestries. Some 15 kilometres from the town, situated in a wild valley, is the Benedictine abbey of Fontfroide with its 13th century church and rose garden. Béziers prospered in the 17th century when the Canal du Midi, which connects the Mediterranean with the Atlantic, was built. The Museum of Fine Art has works by many Flemish and German masters, including Holbein. The Roman Arena is used for bullfights during the feria, in August. Perpignan, once the capital of the kingdom of Majorca, has managed to preserve its Spanish heritage, which is reflected in the architecture and ambience of the town. A little further along the coast are Collioure and Céret. At the turn of the century they were simple villages and the unique light there attracted many painters; Matisse, Derain, Dufy, Picasso, Chagall. Picasso was particularly fond of Céret and it claims to be the birthplace of Cubism. Collioure was a source of inspiration and is represented in many Impressionist paintings. This corner of the region, although called Roussillon, is, after centuries of struggle for possession between France and Spain, essentially and proudly Catalan, the language widely spoken and the red and yellow Catalan flag flying everywhere. 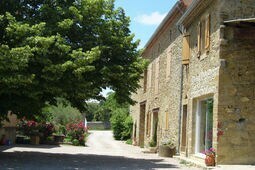 The heart of French Catalonia lies in the villages, forests and valleys of the Pyrenees . Warm early springs and long dry summers, rich pasturelands and the bountiful orchards of the Têt and Tech river valleys, provide France with the out of season fruits and vegetables so essential to the stomach of the nation. The restored mediaeval City of Carcassonne in the Aude, is an astonishing legacy of the bloody and rebellious history of Languedoc and the countryside is marked with hilltop fortresses and ancient towns and villages that bear witness to the Crusade to crush the Cathar heresy. The landscape here is distinctly Mediterranean; wild, rocky hills and hot, stony plains, dominated by the vines of the Minervois and Corbières. The Black Mountains of Haut-Languedoc and the vast National Park of the Cévennes, the limestone gorges of the Tarn and the mountains and lakes of Lozère, are a striking contrast to the coastal plains. Much of this area is a protected, unspoilt wilderness of great beauty, where rural life and traditions have remained unchanged . The earthy, independent character of the people of Languedoc-Roussillon, is reflected in the robust and unpretentious dishes of the region. Strong Mediterranean flavours with a generous use of herbs, garlic and olive oil. Lamb, grazed on wild thyme in the uplands, barbecued over a vinewood fire. Rich game or beef stews cooked slowly for many hours and Cassoulet, the most famous of regional dishes. On the coast there is good seafood and from the mountains, charcuterie, hams, pàtés. Wild mushrooms, oranges and chestnuts are used in many dishes, as are fresh vegetables, grown here in abundance. Roquefort, considered by many to be the king of cheeses, is made at Roquefort-sur-Soulzon from ewe's milk, then laid in the Cambalou caves to mature naturally. Delicious fruit tarts and freshly made ice-cream and from Roussillon little honey and almond cakes and panalets, marzipan sweets with nuts. The wines of Languedoc-Roussillon are growing in reputation and are well worth exploring. Good beaches and resorts along the coast, offering a variety of water sports. Many golf courses throughout the region from 9 to 18 holes, some of competition standard, accessible to all levels and inexpensive. Numerous health spas that offer treatments for a variety of ailments or simply the opportunity to relax and get into shape. There are vast nature reserves that are the habitat for a huge variety of flora and fauna and ideal hiking, rambling, cycling, riding country with good fishing in the rivers and lakes. They are well sign-posted and there are easily available topographical maps. During the summer in the Pyrenees there is mountain climbing, accompanied by experienced guides, mountain biking, or walking. In the winter there are good cross-country ski routes and excellent skiing. Serious walkers can follow the ancient pilgrim routes to Santiago de Compostela that take you across the region. Markets and country bric-a-brac markets in towns and villages on different days and from early spring until late autumn, there are numerous festivals, fetes, classical, jazz and folk concerts. Children are welcomed and included in all activities everywhere. A typical Mediterranean climate with long hot summers, temperatures often reaching over 30 degrees C and short, mild winters. Rain falls in spring and autumn and there can sometimes be strong Mistral winds and summer storms. The inland hills are colder in winter and the Pyrenees have thick snow cover.